The SuperJaws has a long history. First appearing in the UK as an ELU model, but on the demise of that brand, it has since appeared under the Triton colours and is now also available as an upgraded model, the XXL. Although there are a number of improvements, such as easier opening and closing of the tripod legs and a lock down rear leg pad for working on soft ground, the main advantage is having two and a half times the load weight capacity of the currently available SJA200 model. Both have a 1,000lbs of clamping pressure and urethane jaw facings. The new model will take an accessory side support, which cannot cope with the same loading as the SuperJaws itself, but is useful for supporting longer workpieces. 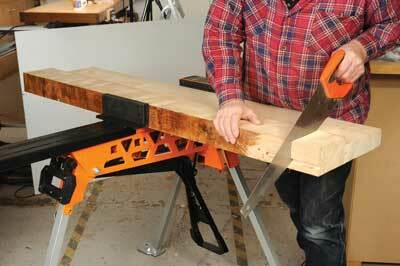 It will also take a roller work support and an accessory tool tray. However it isn't apparent that it will accept any SJA200 accessories. The instructions are emphatic that SuperJaws cannot be used as a work platform, but surely two of them with planks clamped in place across them has to be very solid to work from? The movable jaw can be reversed so you get a big opening capacity if you need it. This tool is not lightweight and remains as clumpy and awkward to heft around as the earlier models. However it gives unswerving support and clamping effort when you need it. Learning the correct way to open out and fold down the SuperJaws when you have finished working doesn't take long to do. The reversible sliding jaw section has a lot of side play, which goes as soon as the pressure is applied and the lock engaged. 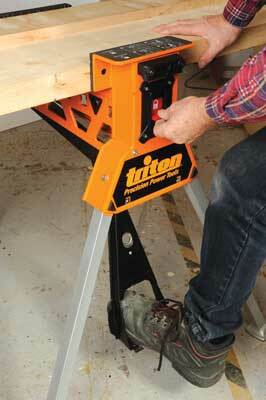 Recently I used the SJA200 model for a lot of fencing work, cutting mortises and shaping post tops. 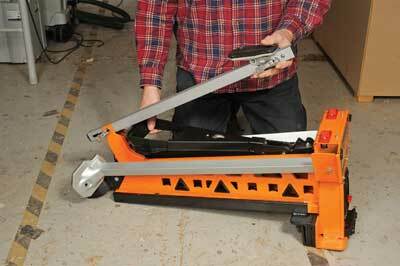 The speed of clamping, unclamping and reliable work holding were perfectly suited to the task. I haven't been able to truly test the load bearing of the XXL, but it should perform as well or better than I am used to. There isn't really anything else on the market that competes with its heavy duty load bearing credentials.